← Find a Font from an Image File! I was configuring a new virtual image today for some upcoming client work, and since my new laptop is now x64, by base image for all future virtual images is Windows Server 2008 R2 (with SQL Server 2008 Development edition installed already). Since R2 is quite new still, I figured I would at least hit one roadblock, and sure enough I did. 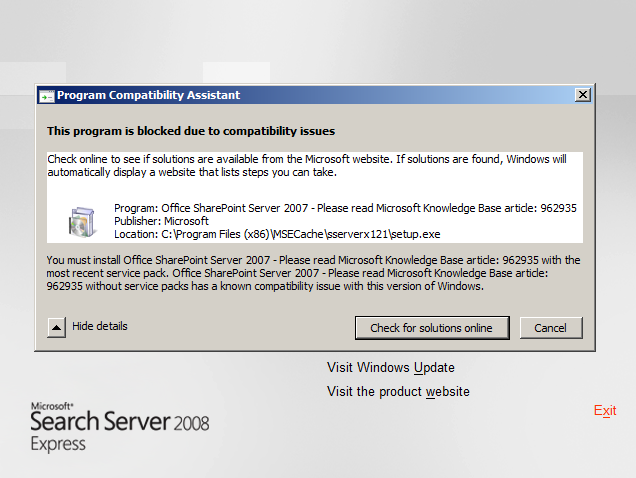 The error itself is a little confusing, especially since I was running the x64 install, and the message indicates an x86 binary… anyways… It turns out that Microsoft Office SharePoint Server 2007 SP2 needs to be slipstreamed into the Search Server 2008 Express install to do so. I will post the instructions below, but, to give credit where credit is due, thanks to Andy Kemp’s blog post here for the instructions – it saved whatever precious hair I have left on my head for other, more important things. Then just run the Setup.exe executable from within the Search Server Express 2008 folder, and you’re good to go.